Shoreline plants found primarily along the edge of water, which are grass-like in form, are included in this category. Alligator Weed: Alligator weed is a perennial plant native to South America and often forms very dense stands or mats that make shoreline access difficult. Aquatic stems are hollow and can be single or branched. Leaves are opposite, long, elliptical or lance-shaped up to 3/4 inch wide and 5 inches long with a prominent midrib. Often roots develop at leaf nodes. Soft, whitish hairs are found in the leaf axis. Single flowers are small (about 1/2 inch in diameter) white, fragrant clusters of 6 to 10 florets, borne on long branches (to 3 inches). The flowers resemble those of white clover. A single seed develops within the fruit. Bulrush: There are several species of bulrushes. Bulrushes are perennial grass-like plants and can grow to 10 feet tall in shallow water or in moist soils. 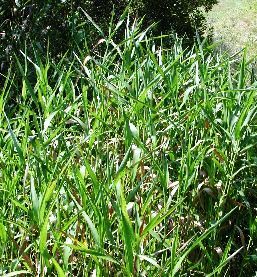 Soft-stem bulrush can grow to 10 feet and grows in dense colonies from rhizomes. Soft-stem bulrush has a round (in cross section), light gray-green, relatively soft stem that comes to a point with no obvious leaves (only sheaths at the base of the stems). Flowers usually occur just below the tip of the stem. Cattails: Cattails have flat to slightly rounded leaves that twist slightly over their length and can grow to 5 or 10 feet in height. Flowers form a dense dark brown, cigar-shape at the end of spikes (called the catkin). 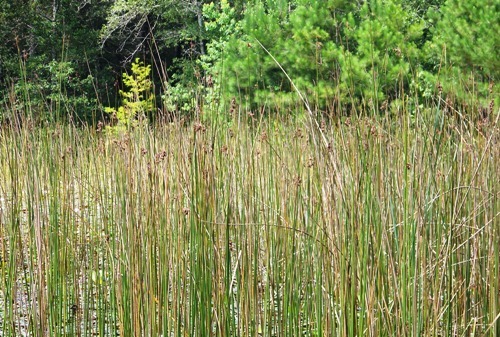 Cattails can be partially submerged or in boggy areas with no permanently standing water. 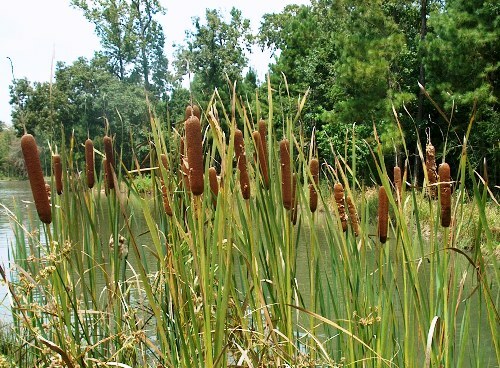 Cattails spread rapidly because their seeds blow in the wind and float on the water’s surface and vegetatively they spread from underground rhizomes. Maidencane: Maidencane is part of a family of perennial grasses that are common but somewhat hard to tell apart. Maidencane can grow up to 8 feet tall and often forms dense colonies. It has long, narrowly tapered leaves(up to 12 inches long and 1 inch wide) with rough upper surfaces and margins. Flowers are on a long narrow spike (up to 12 inches long). Maidencane forms extensive rhizomes by which it spreads rapidly. 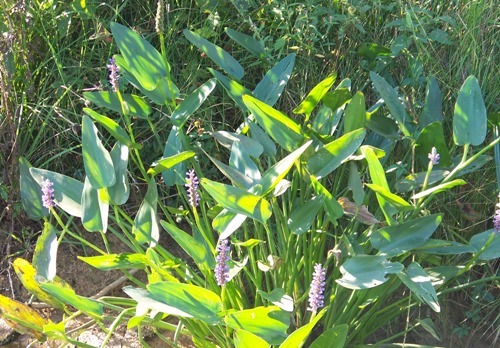 Pickerelweed: Pickerelweed is a perennial plant that can grow up to 3 1/2 feet tall. Leaves are shiny green, heart-to-lance shaped(up to 7 inches long) singly attached to a long petiole which grow in a rosette from the roots. Each stem can produce a terminal flower spike 3 to 4 inches long. The numerous tubular flowers on the spike are violet-blue in color. Each flower lasts only one day. 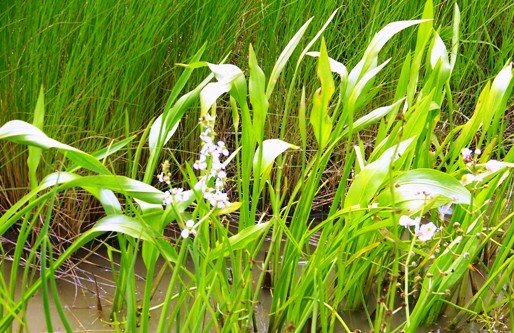 Pickerelweed reproduces from seeds and rhizomes. Red Ludwigia: A classic aquarium plant, grows along the margins of freshwater bodies of water (ditches, rivers, lakes, and ponds). A very polymorphic species in that it readily crosses over with other species of its genus. Similar to Water Primrose. 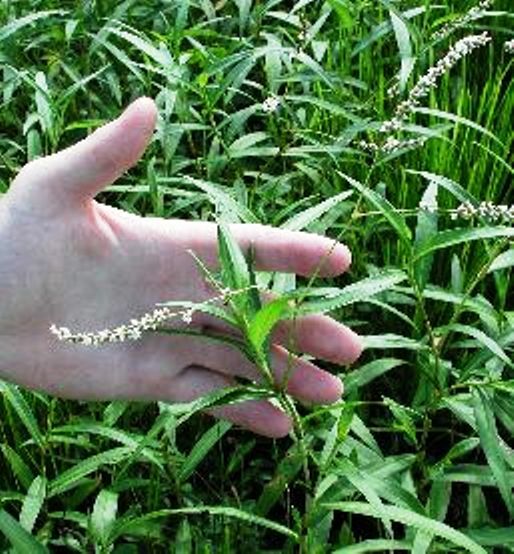 Smartweed: Smartweed (or Water Pepper) is a perennial plant that forms dense colonies in shallow water or moist soils and can grow to 3 feet tall. Stems are jointed or have swollen leaf nodes that are surrounded by a tubular sheath. Roots can develop from the leaf nodes. Leaves are alternate, lance-shaped up to 4 inches long but usually less than 1/2 inch wide. Flowers are on spikes at the end of stems (often numerous spikes on the same plant). Flowers begin as greenish then turn whitish or light pink in color as they mature. Fruits are flat, triangular (1/8 inch), dark brown to black. 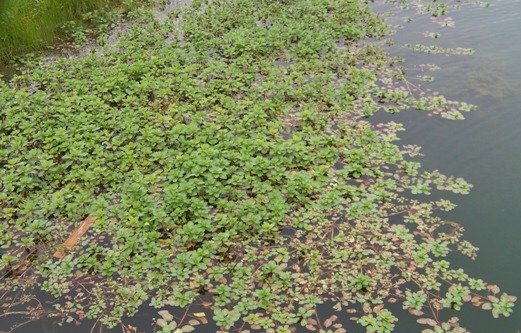 Water Pennywort: Water pennywort is a relatively small perennial plant that seldom exceeds 10 inches in height. 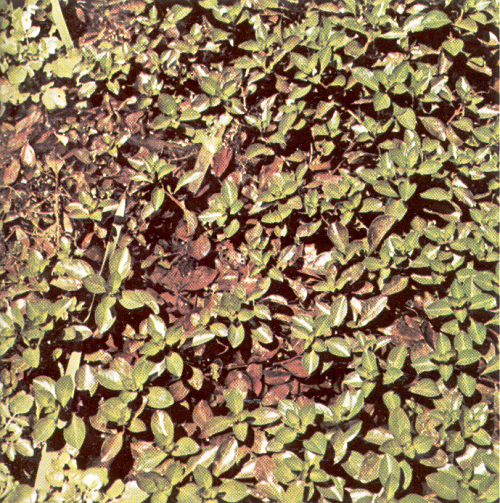 Leaf petioles arise from creeping stems and attach to the center of the leaf. Leaves are round with bluntly rounded toothed margins, up to 2 1/2 inches in diameter. 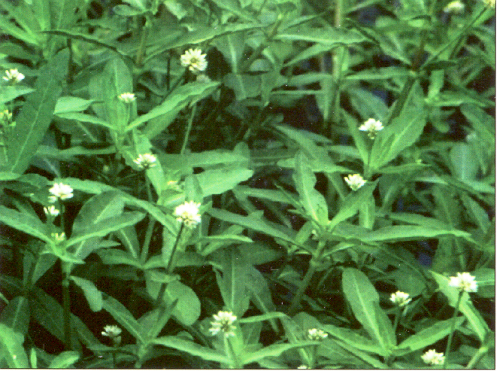 Flowers are borne on separate stalks as tall or taller than the leaves. 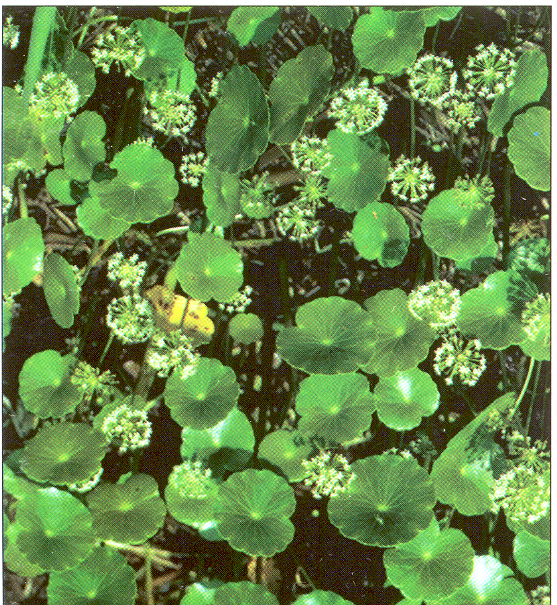 Flowers are white to greenish-white somewhat inconspicuous with tiny simple flowers that arise from a single point on the stalk Pennywort can spread across moist soil or form floating mats on the water’s surface. These mats can break off and form floating islands. Water Primrose: Water primrose is a perennial plant that stands erect along the shoreline but also forms long runners (up to 16 feet) that creep across wet soil or float out across the water surface. These runners form roots at their nodes. Leaves range from lance-shaped or willow-like (2 to inches long by 1/2 to 1 inch wide) on the erect stems to round or oval 91 to 2 inches in diameter on the floating stems. Leaves can be green to reddish depending on the species. The single flowers are yellow with 4 or 5 petals depending on the species. Flowers vary in size from 1 inch to 2 inches in diameter.